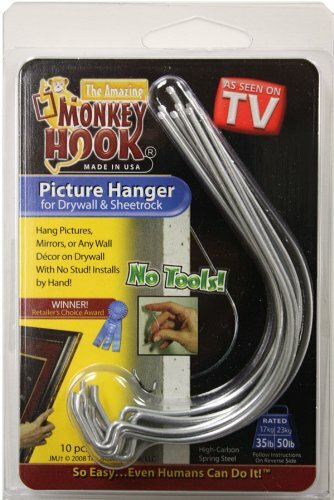 Monkey Hooks are America's favorite way to hang anything on drywall. Just pick your spot, push, twist and hang anything up to 35 lbs. Beware of similar products that claim to hold more weight. They don't. Installs by hand with No Tools or studs needed! For Pictures, Mirrors, or anything hangable! So Easy, Even Humans Can Do It!